Are you looking into garage buildings for sale? Metal garages Mississippi are delivered and setup for free in all of MS. When it comes to ordering metal buildings, MS residents should plan ahead. Metal garages Mississippi are built in many different sizes and styles of 1 car garages, 2 car garages and a metal 3 car garage in MS. There are several different uses for these metal buildings Mississippi property owners purchase. 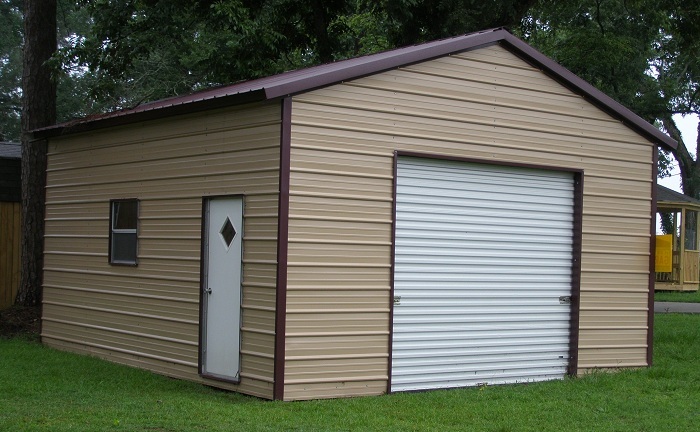 Free delivery and setup on all the different sizes and styles of metal buildings in Mississippi. 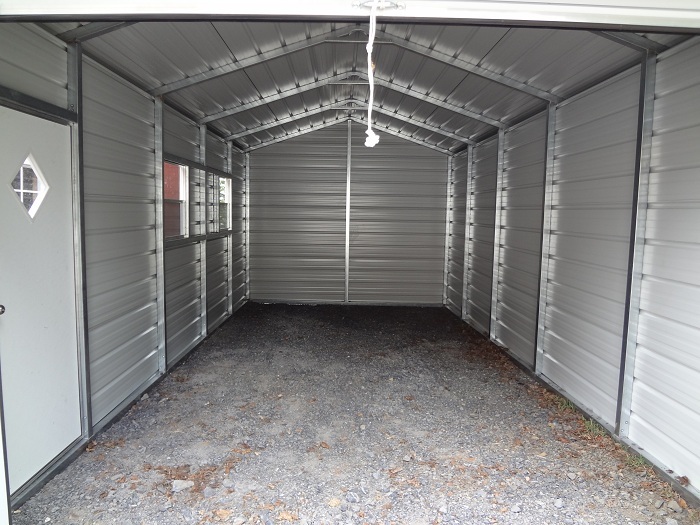 The steel garages in Mississippi are built with 14 ga tubing and 29 ga sheeting. An optional thicker 12 ga tubing is available for metal buildings in Mississippi, which has a 20 year rust through warranty. The metal garages in MS are anchored to the ground for free with rebar or to your concrete pad with concrete anchor bolts. Mobile home anchors are also available. The steel buildings come with center braces. Fully braced with braces on both sides of the garage is another option. These options offer the stability of steel buildings Mississippi residents have come to expect from Alan's. Alan's Factory Outlet's metal buildings in Mississippi are all built on site and finished within the same day the installation crew arrives to setup your metal building. This includes the Amish built sheds and portable storage buildings. Any one of the Mississippi metal buildings can be setup and ready to use quickly and efficiently. Certified Mississippi metal garages are also another option. What the certified means is that blue print drawings are faxed to your local building inspector as some locations require blue print drawings and others don't when it comes to metal buildings MS residents plan to construct. This also means your metal garage is rated for 130 mph wind and 30 psf snow load. The certified package also makes your garage fully braced and comes with mobile home anchors or additional concrete anchor bolts to give it the 130 mph wind rating. 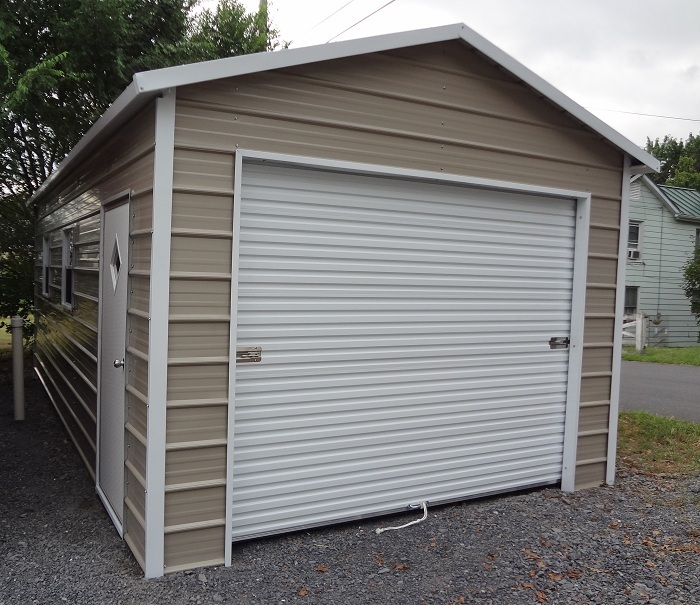 There is also one other additional cost that needs to be covered if you need to order a metal garage certified and that consists of adding additional tubing on both the front and back ends, offering these Mississippi metal buildings extra stability. If you don't need a fully enclosed metal garage, metal carports Mississippi are also delivered and setup for free in all of MS. You could also get a carport and partially close it by either closing the sides or the sides and back end. Carports and garages can be built with taller legs up to 12' tall legs for an rv carport or fully enclosed rv metal garage. There are a variety of possibilities when it comes to metal buildings in Mississippi. Mississippi metal garages come in three different roof styles called regular style, boxed eave style and vertical style. You also get your choice of 13 different colors on your metal buildings. Mississippi homeowners can match their buildings with their current home. When the time comes to purchase metal buildings in Mississippi, choose the quality and workmanship Alan's offers. The steel garages are delivered in all of Mississippi including Jackson, Gulfport, Hattiesburg, Southaven, Biloxi and Meridian MS. We have the steel buildings Mississippi residents want and need. Now is the time to check out our selection of garage buildings for sale.